Yesterday I took Henry to get a trim. I went to pick him up at daycare directly following naps. I snuck in and the lights were still out, but his teacher had gotten him up and they were cuddling.Then my sleepy boy and I went to Tim Hortons for a snack. 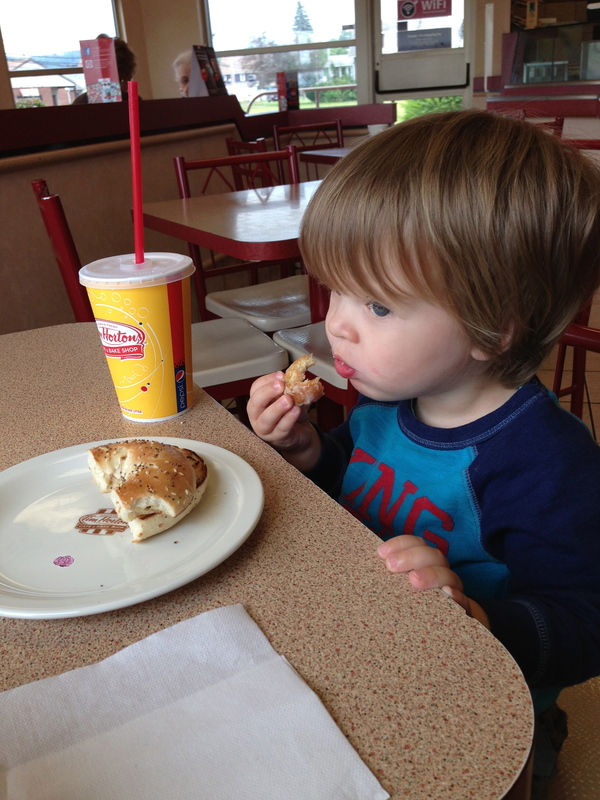 After taking one bite of bagel (a favorite, usually) he switched to Timbits and never looked back. He also loved the sound of his straw when he slid it in and out of the water cup. After our snack, we headed to the salon. 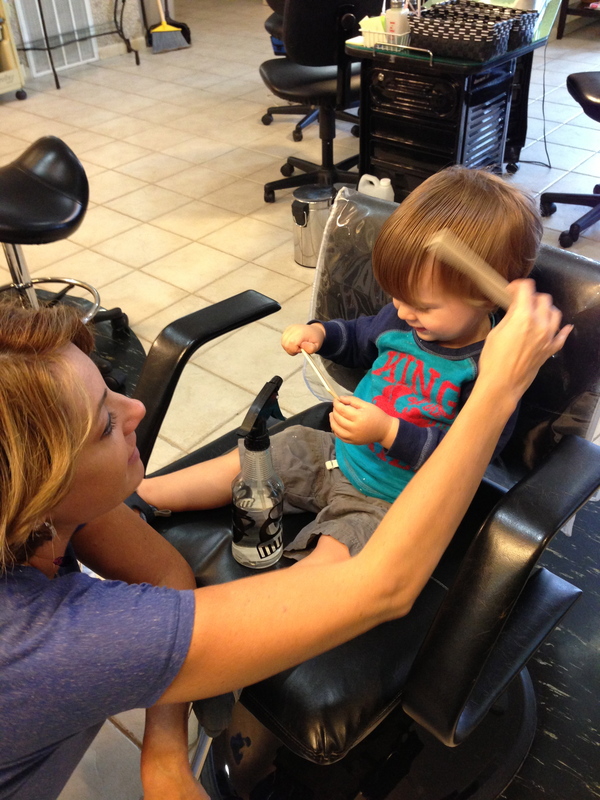 This time, Henry sat in the chair by himself for the first half of his cut. He enjoyed chatting with Mary and holding his own comb. He even combed his own hair a bit, and then combed my hair a bit. He has good technique. After a bit he wanted to sit in my lap, so we sat together. Mary used the clippers to clean up the back, and he was the bravest. She showed him the clippers first, and he happily identified them as a car. He enjoyed the car driving all over his arms and back, and tickling his neck. 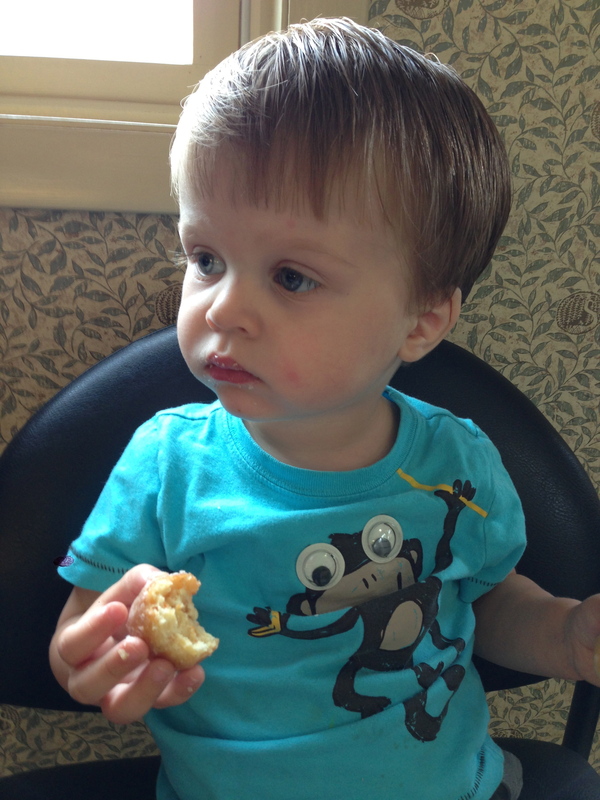 After his cut, he enjoyed a half a Timbit while I checked out and scheduled his next appointment and a girl’s day at the salon with Eleanor. He must have maxed out, because after eating half of the bit, he threw it away, another whole one, and then the box. He really loved the garbage can, incidentally.